Have a fabulous Friday and share the love. 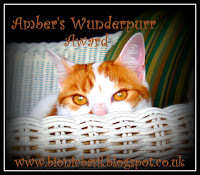 Thank you to the Cherry City Kittiesfor passing this award on to us - we don't know who hasn't received this so if you haven't and you'd like it please do take it and put it on your blog. That is such a nice award. Hope all of you have a great day. There's nothing better than sharing the love...well, some treats while we share would be good. Have a great weekend! That's a very nice image and idea! We'll be here Tuesday for Harry's pawty, for sure. And we promise not to tell Harry, either! This is a lovely award! That is a nice award. I will be here for Harry's party. I won't tell Harry, nuffink! I am a steel vault! Hello there hope you had a good weekend.